I saw Luc Besson’s The Fifth Element near the end of its run in the theaters, and it was love at first frame. 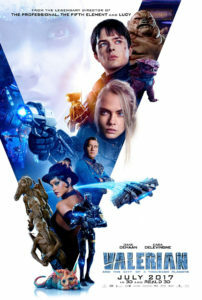 I loved its Manichean/ancient astronauts plot, unique and dazzling visual style (imagine the Coen brothers remaking Barbarella), the madcap action, blond Bruce Willis, Gary Oldman’s Zorg (an evil Ross Perot with slightly displaced Hitler hair and Fu Manchu’s wardrobe), Milla Jovovich’s Leeloo (“perfect”), the blue diva, and of course THE SCREEEEEEEEAM . I really wanted to like this movie and saw the first non-3D screening in my neighborhood. Valerian has the imaginative visual style and thrilling action of The Fifth Element, but the plot is unoriginal, politically correct, and often quite boring: basically a mashup of Zootopia  and Avatar.